DT Systems® Super - ProTM Dummy Launcher. The DT Super-ProTM Dummy Launcher is an excellent tool to help teach and reinforce the hunting situation of the sound of a "band" with the "marking" of a bird in the sky. Great for long and short retrieves by adjusting the flight angle and the strength of the .22 caliber blank launching load. Bump up your dog's training. Order your Dummy Launcher ONLINE today! DT Systems Super - Pro Dummy Launcher Kit with Cordura Nylon Launcher Dummy, White is rated 5.0 out of 5 by 25. Rated 5 out of 5 by Patty K from The dogs love it, they see it, and race up to go for the retrieve We Bought this last summer, and it is holding up well....our dogs line up when it comes out...as they know what is coming! Rated 5 out of 5 by KRH from Completely satisfied with this launcher! We purchased this launcher without the dummy and upgraded to the dummies with the streamer. We're extremely happy with this set up. Rated 5 out of 5 by Cooper from Excellent product I bought this for my 7 month old lab a little over a week ago to get her use to gunshots and longer marks and she loves it. Already have her doing 70 yard retrieves. Great purchase!! Rated 5 out of 5 by hevimetal_duckman from This is the best training launcher you can get. We buy these for training our Duck dogs. They have always been great to work with. 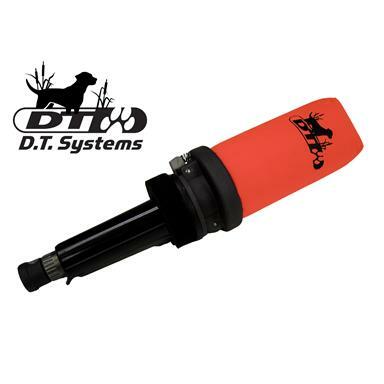 Rated 5 out of 5 by Dpearson03 from This product saved my retriever! After a sudden case of gun shyness in my golden retriever, I found myself on the Internet for countless hours trying to come up with a resolution for my problem. I came across the DT launcher and I decided to give it a try. A slow integration of the product and my receivers case of gun shyness was gone. I ultilized the different power loads dt offers as I slowly but surely worked my way into my retriever getting used to the load noise of a gunshot. This products positives are endless when it comes to training your dog. It not only provides your dog with noise stimulation, but also saved your arm from countless throws not to mention the added distance to your retrieves. This product is the sole reason my dog is a retriever today. Great product and company. Rated 5 out of 5 by Kthomas3610 from Hands down best training tool for steadiness to gunshot! I've used this product training retrievers the last 6 years. By using a .22 cal blank this gives a dog a better chance at gunshot steadiness and allows them to concentrate on the mark more than the shot! Rated 5 out of 5 by Mike3421 from Great launcher! use this to train my GSP when I can't shoot real birds. He loves it! Make clean-up time hassle free!